One of North America’s largest and most celebrated ski resorts, Whistler Blackcomb sits in the spectacular Coast Range, north of Vancouver. And there’s much to celebrate, from ski runs fit for Olympians (and novices) to top-notch dining to outdoor activities for every fitness level. 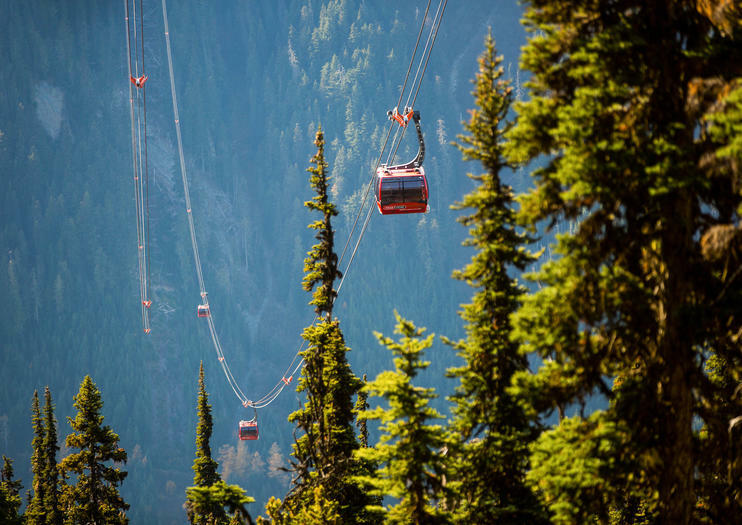 Here’s how to experience all of Whistler in three glorious days. When Vancouver hosted the 2010 Winter Olympics, Whistler’s world-class ski runs gained international attention. There are two primary mountains here: Whistler and Blackcomb, each boasting numerous runs of varying difficulty. Skilled instructors will show you the ropes if you’re new to skiing or snowboarding, or just want to brush up on your abilities. Or, if you want to explore the natural beauty in a more relaxed manner, guided snowshoeing trips trek around the mountains—and going with a guide ensures that you stay safe traveling through avalanche territory. In warmer months, when the snow melts, hiking trails crisscross the mountains. Lace up your boots and ride the Peak 2 Peak Gondola, which runs year-round, to access backcountry terrain. Alternatively, book a half- or full-day mountain biking tour, suited for riders of all levels. With so many mountains surrounding Whistler begging for exploration, getting a bird’s-eye perspective might be the best way to take it all in. Numerous options exist for seeing the glacier-capped range by air. A shorter helicopter or flightseeing tour is a great option for travelers wanting less physical activity. Other options take you heli-hiking or heli-skiing, dropping you deep in the wilderness for access to untouched alpine terrain. Other flights simply land in the backcountry for a picnic after aerial pursuits, allowing you some time in the backcountry without needing much in the way of ability, skill, or equipment. Unwind with a trip to the luxurious Scandinave Spa, complete with multiple hot pools in a mountainside setting. End your night in Whistler Village, where you can grab a top-notch dinner, or explore multiple restaurants via a food tour. The nightlife, ranging from live music to hip cocktail bars, will keep you busy if you’re looking to spend a night on the town. Whistler is a hub for adventure enthusiasts, as there are myriad options year-round for getting your adrenaline flowing. Often these activities last only a few hours, so you can combine several in one day. Maybe you’ll start the morning flying through the air on a zipline over pristine alpine forest. Or dig a paddle into frothy white-water on a nearby river. If there’s snow on the ground, you might opt to zoom through the winter terrain on a snowmobile, a perfect option for visitors lacking ski or snowboard experience or interest. If you enjoy horseback riding, nearby Pemberton is ideal for this sport, with guides leading groups on 1- or 2-hour trips. Other options include riding the Peak 2 Peak Gondola, a year-round attraction that is worthwhile for the views—whether you’re skiing or not. You might also try the Via Ferrata, essentially a high ropes course built high i the mountains. Hop into the saddle and explore the wilds of British Columbia on this 1- or 2-hour horseback ride in Pemberton. Take a leisurely ride through the Pemberton Valley with your guide and enjoy panoramic views over the open Canadian countryside. Travel along the banks of the Ryan River to the mighty Lillooet River. Head through wooded glades, dense forest and rolling fields where colorful wild flowers bloom in the sunshine. Gaze up at the towering peak of Mt Curry and enjoy the deafening silence of the Canadian wilderness. Head to the famed ski town of Whistler Village, the headquarters for many of the 2010 Winter Olympic events, on this winter snowmobile tour. Choose from a morning or afternoon departure time, and then explore the local back-country terrain. Visit scenic trails and lookouts, frozen lakes, and high-alpine bowls on this exciting small-group tour. If you forget some of your winter gear—snow pants, jackets, boots, gloves, helmets, and goggles—you'll have the option to borrow at no additional charge. Hot drink, snack, and lunch are included. Witness the awesome beauty of British Columbia by floatplane on a 2-hour flight and lake landing from Whistler. Delight in panoramic aerial views of BC’s vast alpine wilderness as you drift over mountains, jutting glaciers and hidden lakes, then touch down lakeside for some exploring. You’ll have plenty of time to soak up the surroundings and savor an optional lunch (additional expense) before heading back to Whistler. Avoid the chaos of ski rental facilities while in Windsor with this premium ski rental that includes delivery right to your hotel. You choose the day and time, and a technician brings your ski equipment to you, and lets you try it on to make sure you feel comfortable in it. Plus, after your rental time is up, you just arrange a time for pickup and sit back and relax.